Muziklero is composed of seven priests from the Catarman Diocese of Northern Samar. The group was formed from their desire to offer their talents to raise funds for the many projects of the Diocese. These musically-inclined priests are also ambassadors of the calling, as they want to show the public, especially the youth that priests can also enjoy simple normal activities such as singing and enjoying music. "This was formed as a campaign for more vocations, sending put the message that priests are normal people who have a special calling to serve God through priesthood. 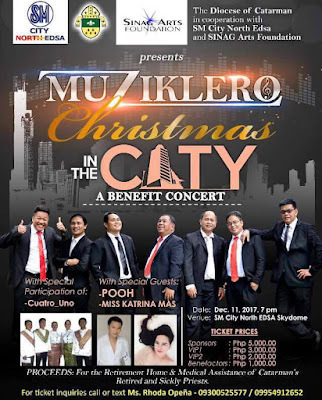 One of the Muzikleros' advocacies is to support the Bahay-Pari, with fundraising concerts such as the one that will be held on December 11, 7pm, at the Skydome of the SM North Edsa in Quezon City. 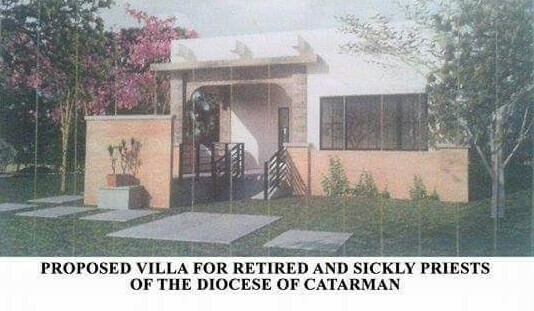 The proceeds of the concert will go toward the medical assistance and retirement homes of priests who are in their twilight years of being in God's service. "We want to acknowledge their service rendered to the Diocese and as an expression of our gratitude to them we feel obligated to give them this gift," says Rev. Father J. Tendoy, the Co-Pastor, Team Ministry. He adds that through the concert, the audience will be able to witness and appreciate a different side of their priesthood. "We are showcasing our God-given talents for a noble cause" as we show that singing is part and parcel of our priestly ministry." The concept was decided upon by the group and since it is Christmas, they want to bring the message of the newly born babe on a poorly clad manger through songs. Fr. Ronie Tendoy, Fr. Gervacio Osias, Fr. Jimel Varela, Fr. Alan Abalon Jr, Fr. Julius Balanquit, Fr. Wendell Rotamola, and Fr. Ryan Opeña will regale the audience with their repertiore of Gregorian chants, Contemporary music, and also Christmas songs sung in Waray. Special guests are Quatro Uno, Katrina Mas and Comedian Reynold Lagrimas, who is also known as Pooh, who also hails from Northern Samar is a special guest, connecting the Muzikleros musical sets with his own repertoire. The Muziklero Christmas in the City concert is made possible through the generosity of the SM Foundation and the Sinag Arts Foundation. For ticket details, please contact Rhoda Opeña at 09954912652 (globe), 09300525577, Josie Espiña at 09176284690 (globe), 09228286652 (sun), 618-3591 (landline). Those who would also like to send cash donations for the building materials to be used for the construction of Bahay Padi, you may get in touch with Fr. Alan B. Abalon Jr., Diocesan Finance Officer at 09175122868, or deposit donations at the Metrobank Catarman branch, at the account of The Roman Catholic Bishop of Catarman - Balay Padi, 346-3-346501694.